Brows play such an important role in a makeup routine. Properly shaped and filled in brows not only frame the face, they also effortlessly pull a look together. My brows aren't very thin, but they are sparse; so filling them in is an absolute must for me. The difference filled in brows makes for my face makes this extra step so necessary, and worth the extra effort. My trusty Wet n' Wild Brow Kit was due for a replacement, but instead of repurchasing another, I decided I wanted to explore something new. When I first saw E.L.F. 's Eyebrow Kit from their studio line, I was immediately intrigued by it. It often gets high ratings, so I thought it was totally worth a try. E.L.F. 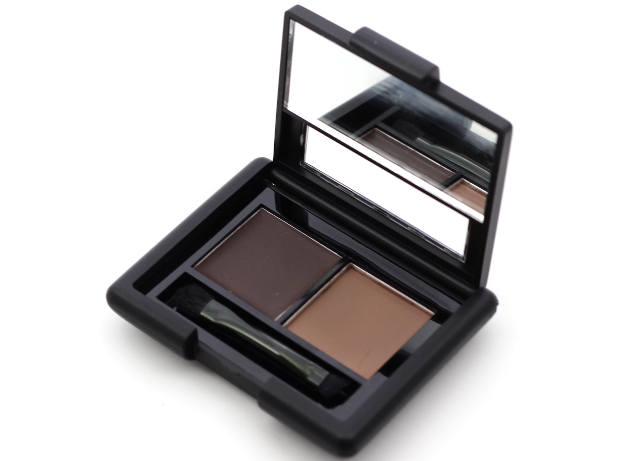 's Eyebrow Kit contains a pigmented brow gel, a powder, and a double ended brush applicator. The kit is available in four color choices-light, medium, dark, and ash. I went with the dark shade, which turned out to be a pretty nice match for my jet black hair. This was my first time working with a pigmented brow gel. I have always relied on brow powders so I had no idea how I was going to get on with this gel, and which method of application was going to produce the best results. Luckily, applying a tinted brow gel is just as easy as applying a brow powder. 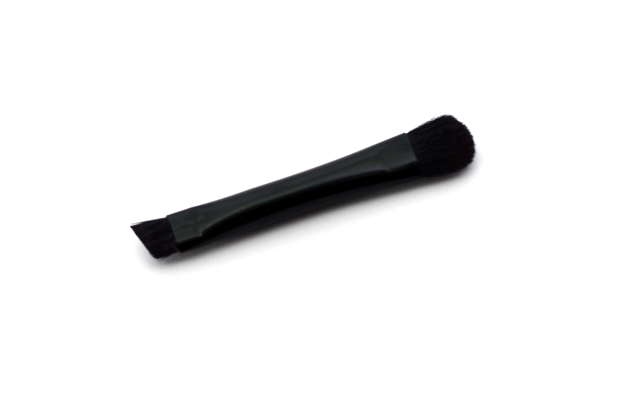 Soft, short brush strokes gets the job done in a pinch. Try not overdo it on the brow gel, though. 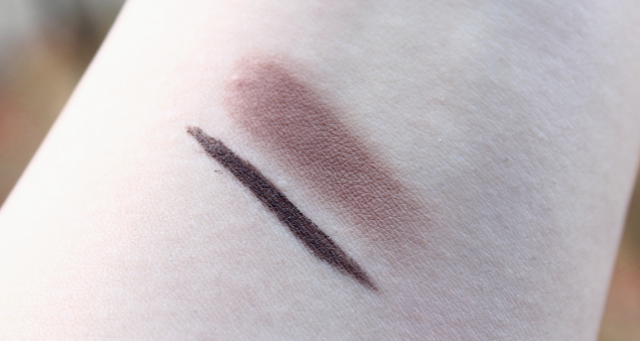 It's very pigmented, and if you apply too much it can look harsh and obvious on the brows. A little always goes a long way for the most natural looking outcome. If you favor a much softer look though, you can fill in the brows with the powder instead, which works just as well. After I have shaped and filled in my brows with the pigmented gel, my brow hairs have a sort of glossy look to them. So to matte down the shine, I apply a bit of the brow powder on top. The powder also helps set the brows, so they stay in place all day long. I usually toss out application brushes included in palettes, but I was really surprised by the double ended applicator brush in this kit, which is actually pretty useful. One side is angled, while the other is more rounded and fluffier. The bristles aren't flimsy at all, and they are super soft. The angled side is great to outline and fill in the brows with the gel and/or powder, and the rounder fluffier side is nice to set the brows with the powder. I like to use my regular brow brush with this kit, but for on the go application, the double ended brush applicator in this kit doesn't disappoint. E.L.F. 's Eyebrow Kit totally exceeded my expectations. It's very user friendly, it produces awesome results, and thanks to this kit, my brows have never looked better. When it comes to affordable, quality brow products, I think it doesn't get better than this kit. Highly recommend! Which are your favorite brow products? Disclaimer: I purchased this product for my personal use. I just checked out the luscious brow kit online, and it looks amazing! The reviews are great! 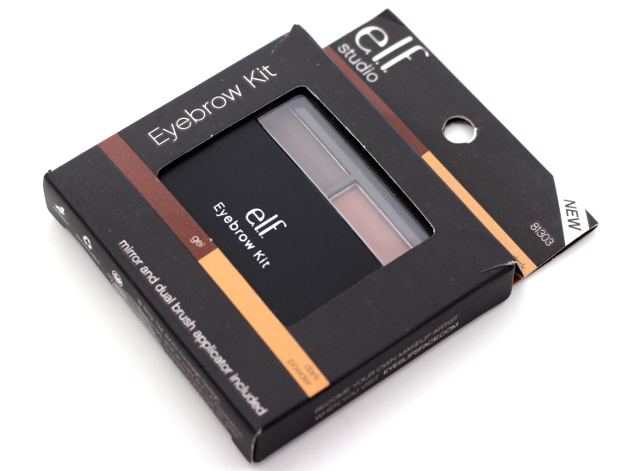 I am so glad to hear that you are a fan of this eyebrow kit, Irene! It really is great! Isn't this eyebrow kit amazing, Jennifer? I think I like it a little better than the Wet n' Wild Brow Kit that I was using before.